Elastic line for fishing. This product comes in a blister of 3 unit spools. The safe bait gives anglers a superior bait elastic dispenser with each spool and it does exactly what it claims! It works with all types of fishing. 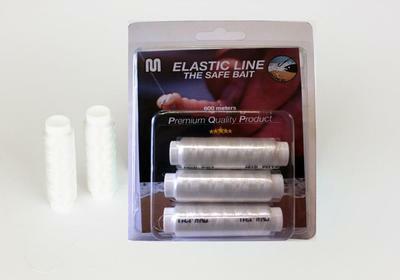 The MATSA product has 1 unique grade of elastic that works for delicate, general and boat fishing. MATSA-ELASTIC-BAIT-SPECS-CARD ON THE RIGHT.